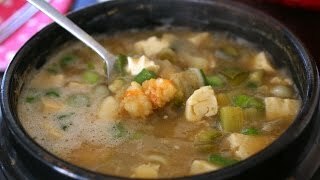 Today my doenjang (fermented soybean paste) project is done by releasing this video recipe: How to make one of the most popular and representative doenjang dishes: doenjang-jjigae aka fermented soybean paste stew! 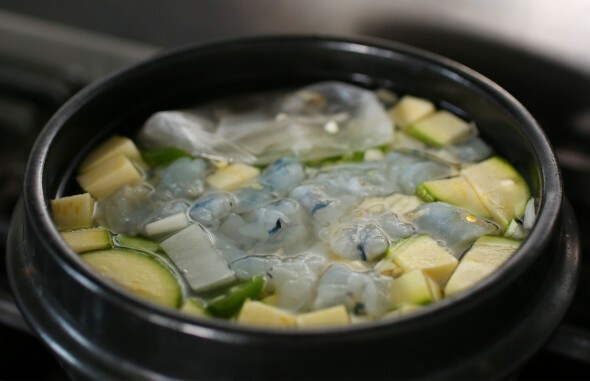 When a Korean mom chooses the first real meal for her baby, she chooses doenjang-jjigae (or soup made with soybean paste, doenjang-guk) with fluffy white rice. To make it go down easy she mixes the stew with the rice and feeds it to her child. Years later, when the child is grown and living far away, she makes it for them whenever they come home again, because every child has ingrained memories of mom’s doenjang-jjigae. It’s something they know and love and are always comforted with. When some Korean tourists travel to foreign countries, the first place they want to go is a Korean restaurant and eat doenjang-jjiage with rice. “Oh, airplane food upset my stomach, I need something to feel good!” And it works! One of my friends who has been living in USA for more than 3 decades stashes a small jar of doenjang into her check-in bag when she travels, because her husband can’t keep eating non-Korean food for an extended period of time. 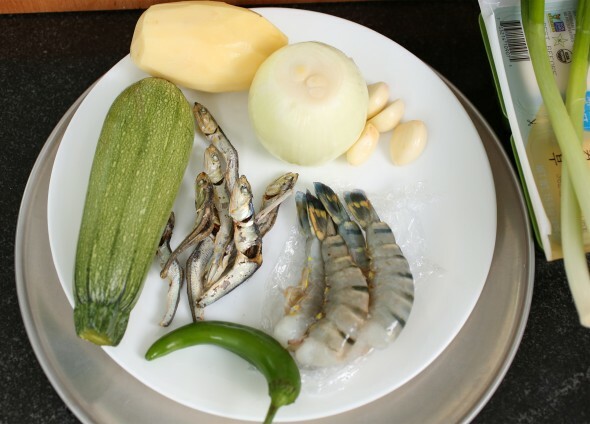 She’ll makes a quick doenjang-jjigae for him in their hotel kitchen. 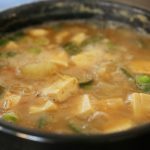 There are many types and versions of doenjang-jjigae (like the recipe I posted years ago, doenjang-jjigae geotjeori bibimbap), and this recipe I’m showing you today is my standard that I’ve been using for years. 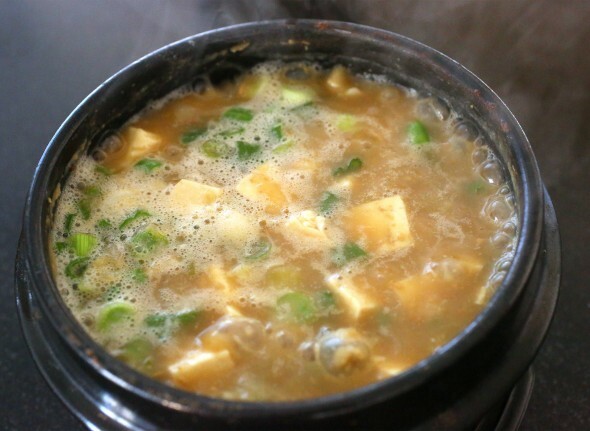 It’s one of my favorite styles of doenjang-jjigae and is in my cookbook, too. What makes me more excited about it today is that I made it with my homemade doenjang! 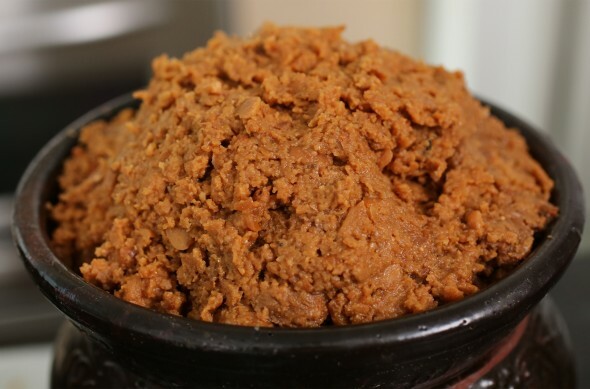 Most of you don’t have homemade doenjang, so you can use store-bought doenjang with the same recipe. It will still be delicious, I promise! Combine the potato, onion, zucchini, chili pepper, garlic, and shrimp in a 1½-quart (6 cups) earthenware pot or other heavy pot.Wrap the dried anchovies in cheesecloth (or a dashi bag, a pouch for stock-making sold at a Korean grocery store), and put them into the pot with other ingredients Add water and cover. Cook over medium-high heat for 15 minutes until it starts boiling. If you use a stainless steel pot, it will take less than 15 minutes, about 7 to 8 minutes. Stir in the soybean paste, mixing well. Cover and cook for 20 minutes longer over medium heat. Add the tofu and cook for another 3 minutes. Remove the anchovy pouch and discard. Sprinkle with the green onions and serve as a side dish to rice. Serve it directly from the pot, or transfer to a serving bowl. Everybody can eat together out of the pot, or portions can be ladled out in individual bowls for each person. Posted on Monday, January 25th, 2016 at 10:05 pm. Last updated on December 4, 2016. Posted April 3rd, 2019 at 1:01 pm | Log in to reply. This recipe was originally posted on January 25, 2016 at 10:05 pm by Maangchi. It was last updated on December 4, 2016. The video was watched 1,384,220 times on YouTube & has 20,324 likes!